Breaking Games is fairly new to me, I don’t remember seeing much about them prior to Origins this year. I did see their banners for “Poop: The Game” in the dealer hall. Examination of their website advertises them as the new promotion and publishing company of AdMagic, a producer of custom board games. Further web investigation shows the company to be the producer of the iconic black and white cards seen in Cards Against Humanity. In any event, the company’s profile seems to be growing. They are one of the sponsors of GenCon, as I have seen their logo prominently on some of the media emails from the convention. They have also picked up rights to a few other games, most notably Klask – a game which I fell in love with at Essen 2015. In The Game of 49, the players play their markers on a board with a 7×7 grid, with the goal to get four of their chips in a row. The numbers on the board are arranged in an inward spiral with the number one in the top left of the board and circling around until ending with the number 49 in the center of the board. Each player starts with $49 and gets a supply of chips in their color. The deck of 60 cards is shuffled and placed in a card tray. The deck is made up of number cards from 1 to 48. Each of these numbered cards has a minimum bid amount printed on the bottom of the card. The other twelve cards are wild/payoff cards with specify a certain ring of the board. A player is chosen to be the start player, and the game begins. The starting player draws the top card of the deck and shows it to all players – there are different rules depending on what sort of card is revealed. 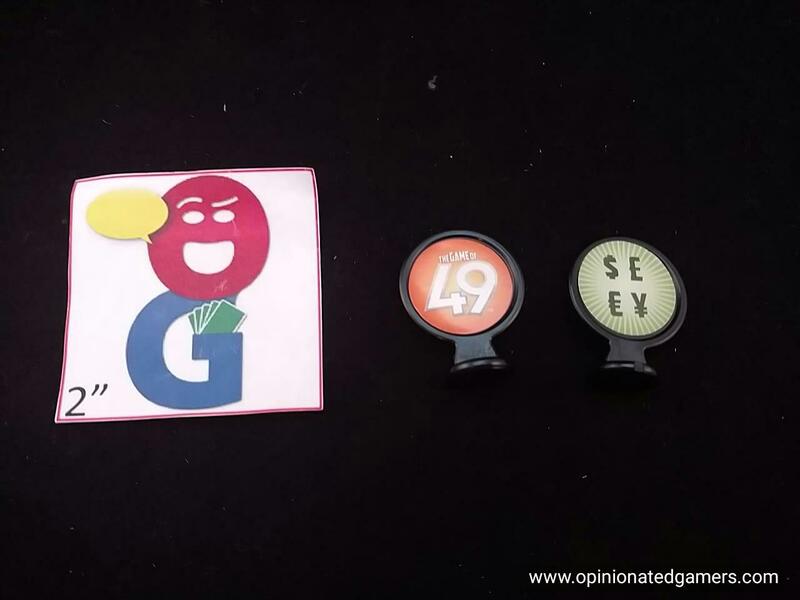 If it is a numbered card – the auction token is placed on the matching spot on the board. Then, the start player has the option of starting the auction (by bidding an amount at least as much as the opening bid) or he can pass. If he passes, the next player in clockwise order has the same two choices. If all players pass around the table, the card is discarded from the game. If a player chooses to start an auction, bids continue in clockwise order. Players must make a higher bid or pass out of the auction. If a player passed on the initial offer of an auction on this card, they may not rejoin the auction when a later player offers it up. The winner of the auction pays the winning bid amount to the bank and then places his own colored marker on the corresponding spot on the board; he also keeps the card corresponsing to that space. 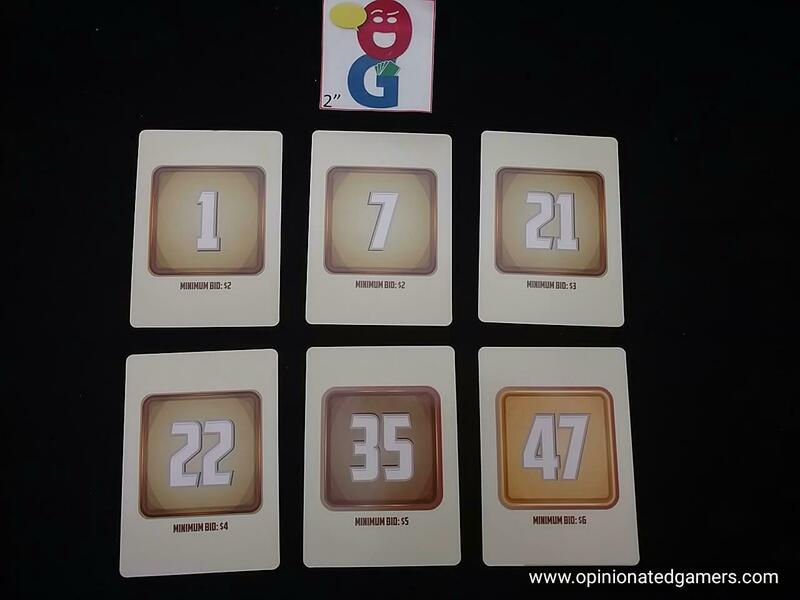 The starting player token now moves one space clockwise and that player draws a card to start the next turn. If it is a wild/payoff card, the rules for auctioning it are the same. However, there are varying rules depending on which card came out. The most prevalent wild card is for the number 49. This is the only card which allows you to bump another chip out – if you win the auction for this card, you are allowed to place your chip on the 49 spot and displace any chip which was already there. As a bonus, if you already control the 49 space and you win the 49 card again, you can then place one of your chips on any empty space on the board. For the other three types of Wild cards, you must place your chip on any empty space in the specified range. After any wild card has been dealt with and a chip placed on the board (or if it is discarded because all players choose to pass on auctioning it), then there is a payout. ALL players now collect $7 per chip placed on the board, to a maximum of $49. If a player ever draws a card which is deemed to be unplayable – because you could not play a chip on the space(s) designated by the card, it is immediately discarded and the same player draws another card. It should be noted that if a Wild card is discarded in this manner, players still collect a payout. Also, you are on your honor to not bid more than you have. If you ever win an auction by mistakenly bidding more than you have, you are penalized by losing a chip on the board. Take all the cards which you have won to that point and shuffle them. Draw one at random and then remove the corresponding chip. That card is removed from the game. The initial card from the auction is then re-auctioned with all players being able to participate in the repeated auction. The game ends immediately when any player is able to place a chip that forms a row of 4 chips of his color in any direction. The game also ends if the entire deck is exhausted without a player achieving an uninterrupted row of four chips. In this case, the player with the most chips on the board wins. If there is a tie, the player with the most money left wins. If still tied, the tied player on the higher numbered space wins. 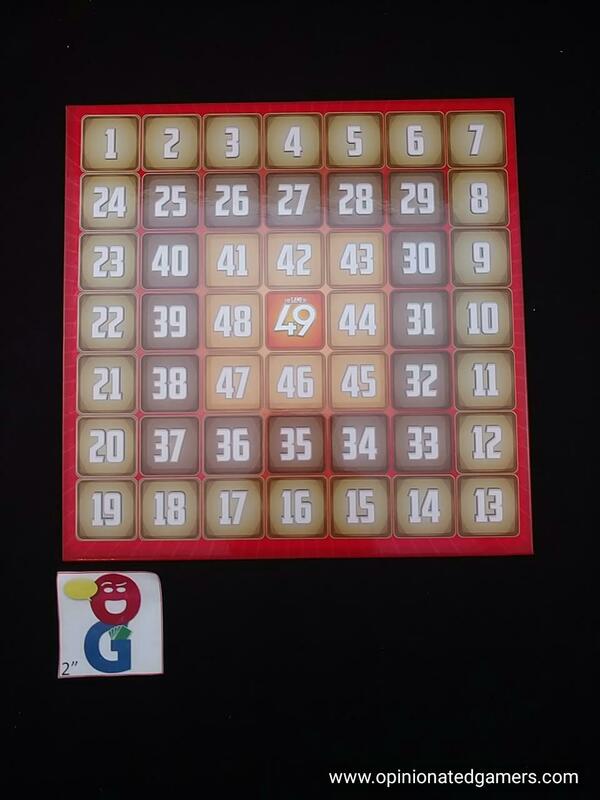 The Game of 49 is a nice family game which made it to the table over the July 4 weekend. The rules are easy to explain (well, with one exception… We were playing with some younger kids and we ended up not using the optional checking rules on bidding as this seemed to overwhelm some of our younger cousins…) The game moves along quickly, and the rules and objectives are simple enough. There does seem to be a bit of an advantage to winning early auctions as you have a higher chance of getting a better payout if the wild cards come out early – however, once everyone realizes this – the early auctions go for a pretty penny, and this tends to neutralize this advantage as the cost of the initial spaces rises. 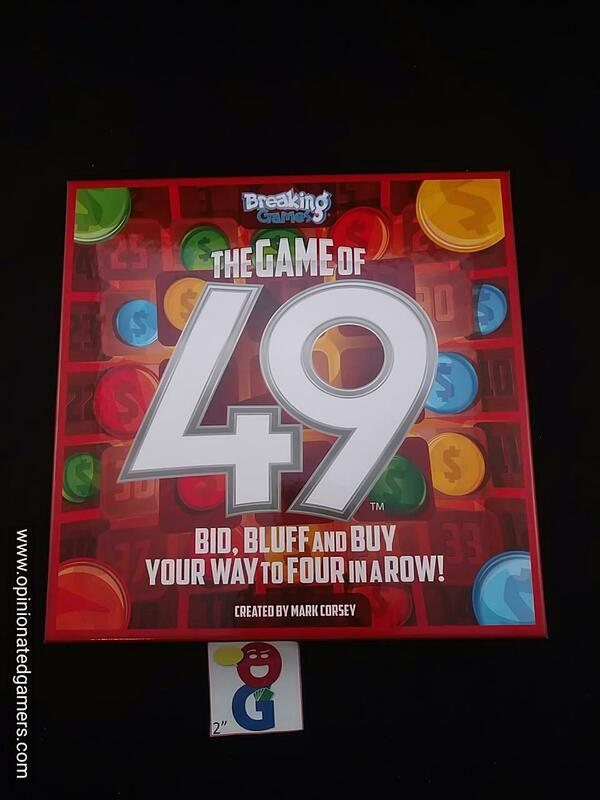 While most of the bidding is straightforward – you’d really like to get spaces that are in a line or pattern that allows you to form a line of four – you also need to try to bluff and bid up your opponents to ensure that they aren’t getting the spots that they want for cheap. 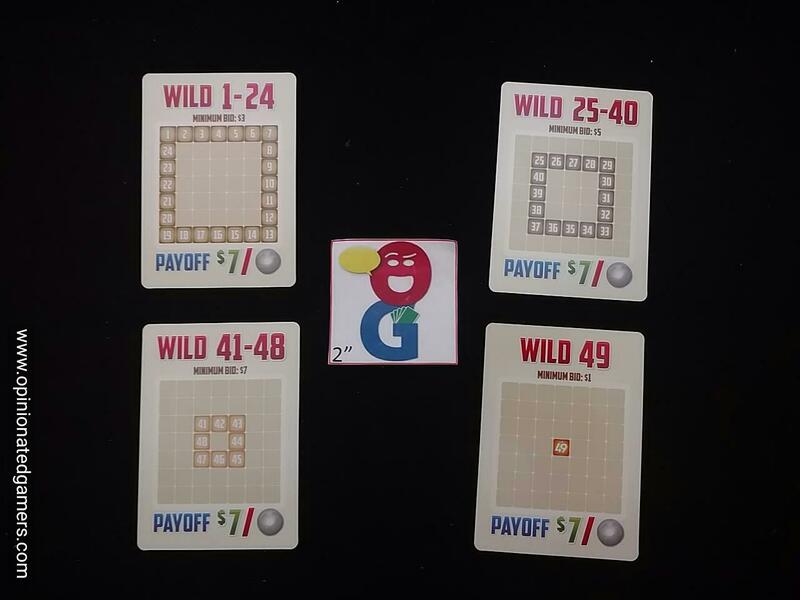 In our games so far, players build up a couple of pairs, and then there is a bit of saving money with payouts so that you have a superior advantage in money to win the crucial spot to finish your row and win the game. There may also be a bit a “Kill Dr Lucky” endgame where games will end prematurely if one of the players doesn’t fall on their sword to stop another player from winning. For a family game, this is a good introduction to the auction genre. It’s not going to replace Modern Art or Medici for my game group, but that’s also not the target audience for this game. We’ve enjoyed it with non-gaming family members, and it’s the sort of thing that I’d be happy to steer someone towards in the gaming aisle at the mass market big box store.